On July 3, France will officially open the last 66-mile gap in its high-speed Paris-Strasbourg “TGV Est” line. Initially, in that gap, 16 miles will be single-track, pending repairs to the segment damaged in the fatal testing accident last year, but TGV trains should be able to operate at top speed. Paris-Strasbourg times will be under two hours. (Maybe) High Speed. Korea opened a 6-mile maglev system this month, but it’s strange. Presumably, the big deal with maglev is that it can go faster than even the fastest trains. TGV type trains currently top out at 350 kph (220 mph) on most routes, and none is planned for anything more than 400 kph within the foreseeable future. The Shanghai maglev tested at 500 kph and gets up to 441 kph in regular service. By contrast, the Korean version tops out at a leisurely 110 kph over its 4-mile route that runs from Incheon airport (Seoul’s main international field) to a nearby coastal resort area. It acts more like a theme park ride than a serious transportation system–a conclusion buttressed by the fact that it’s free. China’s latest plan is to have 30,000 km (19,000 mi) of high-speed rail in place by 2020, which will amount to more than half of the world’s total high-speed miles. I haven’t found any accessible maps of the Chinese system, but even now, you can figure that just about anywhere you want to go, you can take a high-speed train. And the U.S.? 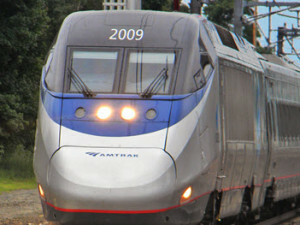 We have two short stretches of the Northeast Corridor near Providence where Acela trains can hit 150 mph, with no significant plans for improvement. Feh! Several countries including Malaysia, Indonesia, and Morocco have announced new high speed plans, but you aren’t likely to find any trains operating for at least 10 years.